The jewel of the heartland. The Iowa State Capital has been a source of great pride for many generations of Iowans. Laura Malloy was part of a design team engaged for this long-term restoration project covering 300,000 square feet of the 1886 building. 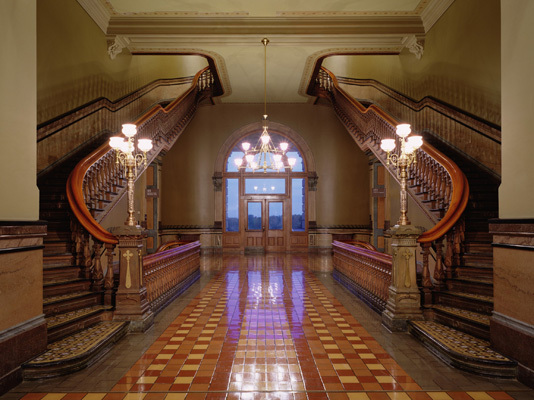 Among the rooms restored were: the House and Senate Chamber; the Supreme Court; and the Governor’s office. Badly deteriorating exterior sandstone elements were either resurfaced or replaced with color-matched limestone. New energy-efficient wood windows duplicate the original windows and the copper roof and skylights were also replaced. In the interior phase of the restoration, original light fixtures were carefully recreated. Original stenciling was uncovered and restored. Flooring materials, furniture and window treatments were replaced with the period style pieces.